Systems for real-time composition of background music respond to changes of the environment by generating music that matches the current state of the environment and/or of the user. 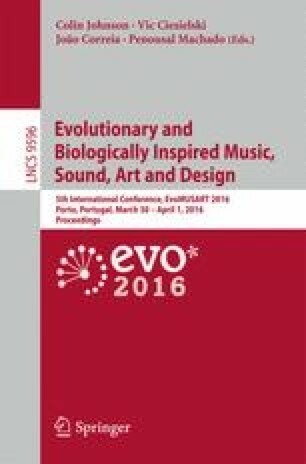 In this paper we propose one such a system that we call EvoBackMusic. EvoBackMusic is a multi-agent system that exploits a feed-forward neural network and a multi-objective genetic algorithm to produce background music. The neural network is trained to learn the preferences of the user and such preferences are exploited by the genetic algorithm to compose the music. The composition process takes into account a set of controllers that describe several aspects of the environment, like the dynamism of both the user and the context, other physical characteristics, and the emotional state of the user. Previous system mainly focus on the emotional aspect. EvoBackMusic has been implemented in Java using Encog and JFugue, and it can be integrated in real and virtual environments. We have performed several tests to evaluate the system and we report the results of such tests. The tests aimed at analyzing the users’ perception about the quality of the produced music compositions.